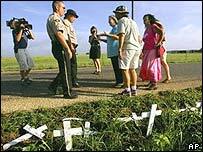 Cindy Sheehan's roadside protest outside President Bush's ranch has rallied America's anti-war movement. It has also attracted a posse of experienced activists and advisers who sense political advantage to be gained. And it has stoked conservative rage. Frank J Murray, writing in the Washington Times, called Ms Sheehan "the poster child for surrender". It's worth remembering that we are in the middle of August. The president is at his ranch. 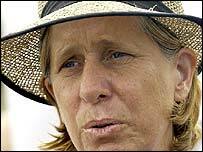 And the White House reporters assigned to sit out the summer in sun-blistered Texas are no doubt grateful for the Cindy Sheehan story unfolding under their noses. It's possible that Ms Sheehan would not have received the attention she has, were we not in the summer news drought. Yet she has rejuvenated America's anti-war activists, and is causing commentators - particularly on the left of the political spectrum - to wonder if popular support for the Iraq war is approaching a "tipping point". Predictions that US public support for the war is on the verge of spiralling downward, Vietnam style, have been with us for a while, and so far have not been borne out. But Cindy Sheehan's is not the only questioning voice that is capturing America's attention. A reserve unit, the 3rd Battalion 25th Marine Regiment, had 20 fatalities in one week while operating in western Iraq. All of the battalion's marines came from Cleveland and Columbus, two cities in Ohio. In contrast to troops in regular units, reservists who serve together tend to come from the same geographical area. The deaths of the marines had considerable local impact. One of the dead was Edward "Augie" Schroeder - a 23-year-old college student. Immediately on hearing of their son's death, Paul Schroeder and Rosemary Palmer decided to speak publicly about their grief and anger. We interviewed them at their home in a suburb of Cleveland. "After 27 months of trying to clear out insurgents in this town, that town, it's not working," Paul Schroeder said. "The logic would be: If you want to support the troops, give them the material and the numbers they need to do the job or get out." His wife, Rosemary Palmer, concurred. "President Bush had said he wants to support the 1,800 [troops] who've died by continuing the war until we win. "Well, continuing the same thing without changing what you're doing is like the classic definition of insanity - doing the same thing over and over again and expecting a different result. "So if we're not going to do it differently, it's just going to be throwing 1,800 more bodies on the same scrap heap." Poised and articulate, Paul Schroeder and Rosemary Palmer have been all over America's airwaves. Their status as parents of a dead soldier lends them tremendous moral authority in the eyes of their American countrymen. And their measured call for the Bush administration to level with the public and to change Iraq policy seems to strike a chord with those who are troubled by the casualty figures and the open-ended nature of the US commitment in Iraq. Only the slightest of hints suggest that the Bush administration is in the process recalculating its position on Iraq. A front-page story in the Washington Post last weekend reported that US policy makers are indeed re-evaluating what is possible there. "We are in a process of absorbing the factors of the situation we're in and shedding the unreality that dominated at the beginning." The story caused a buzz around Washington. But it was read in different ways by different players. Some saw it as evidence that the Bush administration really is accepting that Iraq will not achieve democracy and constitutional government, and that the United States will accept something short of that as constituting victory. But one reader who is deeply involved in Iraqi politics saw it as a sort of temperature-taking exercise: The unnamed official, he said, was putting out the idea of re-evaluating Iraq policy in order to see what sort of reaction it received. And to refuse the imposition of a deadline for US withdrawal. The Bush administration is hoping that the passage of a new Iraqi constitution and elections to a new government - scheduled for December - will reinforce a sense among Americans that progress is being made in Iraq. The administration wants to replicate the surge of popular enthusiasm for the war that followed Iraq's January elections. Yet the polls show that Americans continue to fear the outcome of the Iraq war. The Gallup organisation found that 56% of Americans believe that the war in Iraq is going very badly or moderately badly. These results, says Gallup, are among the most negative since 2003. A poll in the influential publication Foreign Affairs found that the public's opinion of US foreign policy is deeply split - just as it is on domestic policy. The poll found a clear majority of Democratic voters expressing unease at the administration's managing of the situation in Iraq, Afghanistan and beyond, and a clear majority of Republican voters showing understanding and support. The consequence of such a split is clear: The debate over the rights and wrongs of Iraq has taken on the broad ideological overtones - conservative versus liberal, religious versus secular, rural versus metropolitan - that shape America's polarised politics. America is not yet experiencing a collapse in public support for the war. But voices like those of Cindy Sheehan, Paul Schroeder and Rosemary Palmer are contributing to greater volatility and unpredictability in the Iraq debate.